I don`t need to tell you that this is a very terrible time in the world`s economy. Economy is bad, things are expensive, your income is no longer sufficient to take care of your need. You can be rich, even in this bad economy. As African, you might have been told and believe the popular lie that Africa is bad and that there is no opportunities for wealth creation here. That is a lie and if you believe it you`re doomed. I just finished communicating with an Indian man who will be traveling down to Nigeria tomorrow morning and he needs the ABC to help him with his potential business. This man I am talking about is already having a business in Nigeria, he and other foreigner partner from Thailand and planning to start another business. When some Africans are complaining that their countries are bad, some foreigners, from so called “advanced countries” are coming to take advantage of our continent`s riches. 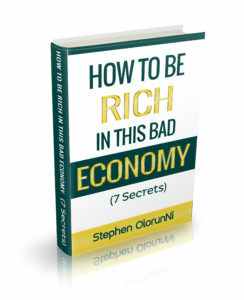 This business book will show you the 7 Hidden Secrets of Riches in This Bad Economy.